Reports show that middle management (i.e. laboratory managers, principal investigators (PI)) spends 35% of time in meetings, while upper management spends 50% of their time in meetings (1). The figures for researchers and technicians are less scary but still significant. Approximately half of these are update meetings. Laboratory managers spend 35% of their time in meetings. So if laboratory managers and PIs would have a (mobile friendly) electronic laboratory notebook (ELN) software that enables them to see the latest updates and comment on them, they would save 172.5* hours annually. The time that we save by embracing some of the best practices can be “reinvested” to research planning and business development which ultimately increases efficiency and generates revenue. How much time do you spend on searching for documents and eventually find it in a folder that you would least expect. If you do that only 10 minutes each day, that sums up to more than 35 hours annually! I often wish my old paper notebooks would have hidden CTRL+F buttons. Not to mention that a person that might fill my position, will not have a clue what has been done and where to search for the results. A researcher spends more than 35 hours annually for unnecessary data search. 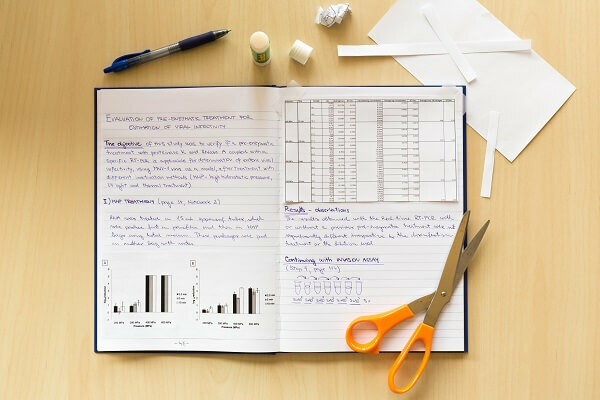 Traditional practice of using paper lab notebooks nowadays also results in the fact that 17% of research data is lost annually (3). This is a clear sign that we should change our habit of printing, cutting and gluing for a digital way of storing an managing our research data. Good time management in general is an everyday challenge. It is not just about increasing efficiency, but also having time to relax and maybe have a cup of coffee with your colleagues. And that is when great ideas are born.